← Are We Destined for Fleeting Work/Life Balance? I know I’m supposed to be posting about 3 things companies should be doing now to make flexible work a more viable career path in their firm, but something happened yesterday that I just have to share. Arianna Huffington asked me for my business card. How crazy is that? Okay. Granted, it was at a book signing… and it was the result of polite chit-chat… and the chances that anything more will come out of it are nil to nothing. But, as my business partner, Anna Marie Etcheverria, pointed out, “she asked you for your business card”. Let me back up. 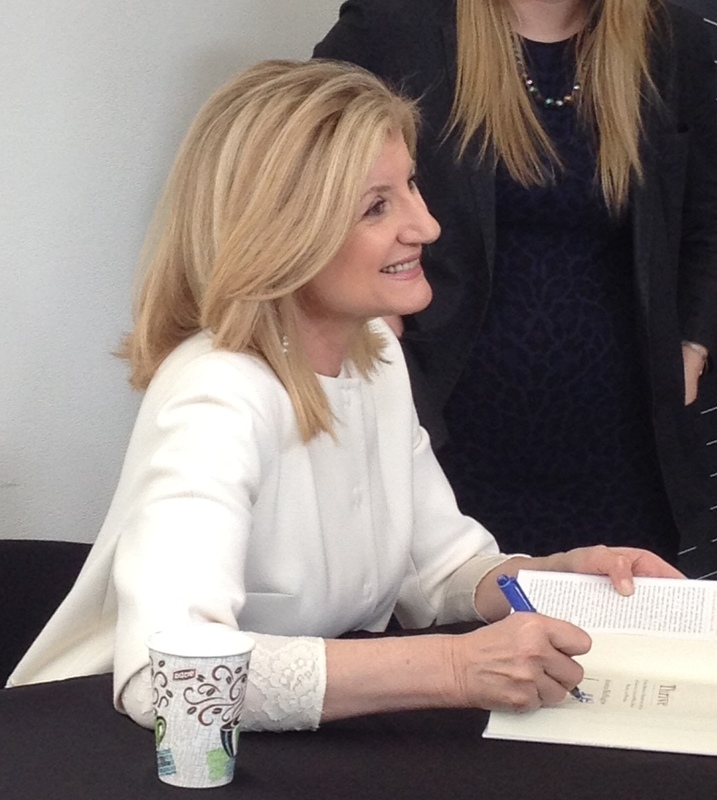 Yesterday, Anna Marie and I went to see Arianna Huffington speak at Watermark’s Speaker Series in San Francisco. Arianna is promoting her new book Thrive, a perspective that is very much in alignment with our goals at our own company, and with the products and resources we are creating. The idea of Thrive is to measure our success using a third metric. This metric includes four pillars: well-being, wisdom, wonder, and giving. Coming on the heels of publishing yesterday’s post “Are We Destined for Fleeting Work/Life Balance”, I couldn’t help but feel an overwhelming sense of alignment between Duncan+Coleverria and Thrive, and a not-so-subtle message that we are on the right track. This alignment and clarity brought an amazing feeling of success, that most certainly isn’t measured by revenue, salary, or other traditional markers of success. Probably nothing will come of Arianna Huffington taking my business card; however, what was successful was sharing this thrilling life and career experience, an experience that we can both take with us and use as fuel to propel us as we move forward in growing our business. Did I mention Arianna Huffington asked me for my business card? This entry was posted in General Musings and tagged business challenges, flipside workspace, Work–life balance. Bookmark the permalink. 9 Responses to Arianna Huffington Asked for My Business Card? She would be smart to contact you! Thank you Laura, I am a big believer of following the signs and what a beautiful sign this was! Thank you always for your support! I’m not sure i get the gist of this post. Please clarify! Did Arianna Huffington ask for your business card or not?! Ha! BTW, I checked out your blog – you’ve got a great gift, so funny and sharp! I’m a follower! Thanks for stopping by.